Many Chinese begin the morning of Lunar New Year with Buddha’s Delight or Lo Hon Zai (simplified Chinese: 罗汉菜; traditional Chinese: 羅漢菜). As it’s a mixed vegetables dish, commonly known as chap chai (literally: mixed vegetables in Chinese). 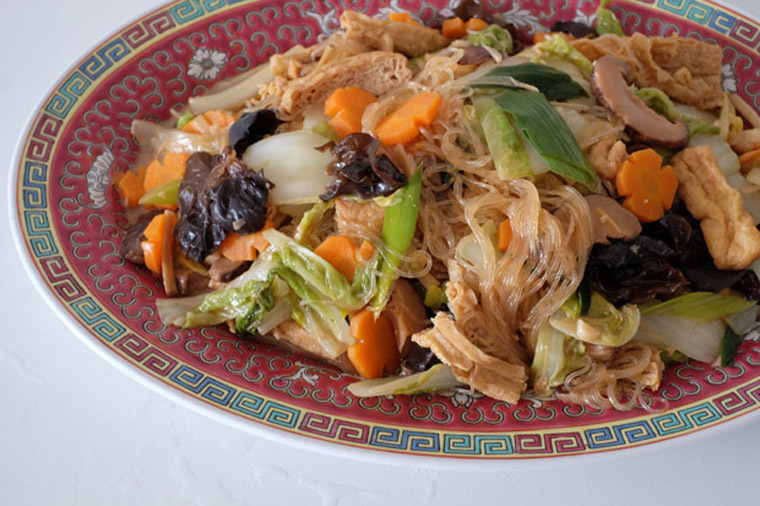 This dish is named as such because it is traditionally eaten by Buddhist monks who are vegetarians. Various vegetables are cooked in soy-based seasoning until tender. In Nyonya chap chai, fermented soy bean paste (tau cheong) is used and often added with prawns. According to wikipedia, these are the commonly used ingredients (source). Pick and choose ingredients that you and your family likes. 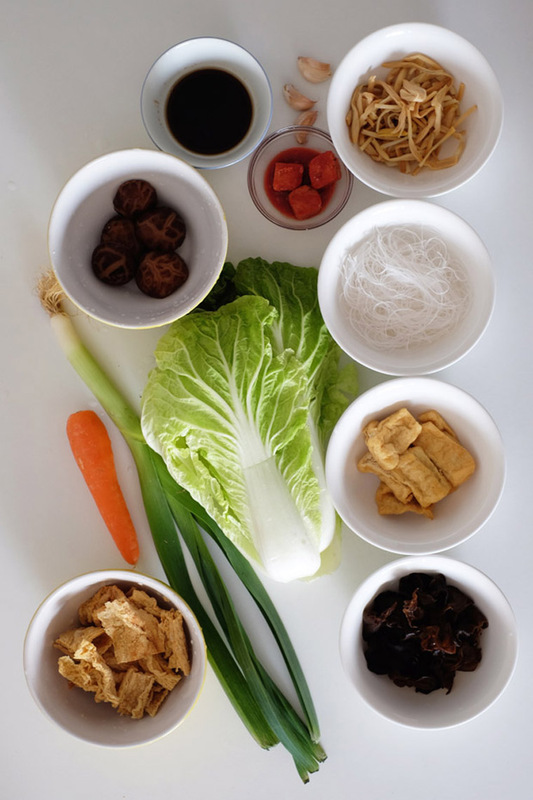 For the purpose of Chinese New Year celebration, I chose nine ingredients which number represents longevity. Each of the ingredients are auspicious, and which gives the dish both colour and texture. They are also easily available where I am. Step 1 SOAK VEGETABLES: Soak the fungus, mushroom, lily buds, beancurd sticks and glass noodles in water for 15 minutes, or until soft. Step 2 MAKE SEASONINGS: In a bowl, add 2 tsp of sugar, 1 tsp of sesame oil and 2 tbsp of soy sauce. Step 3 CHOP VEGETABLES: Soak Chinese cabbage and chop into 2 inch pieces. Peel and slice carrots. 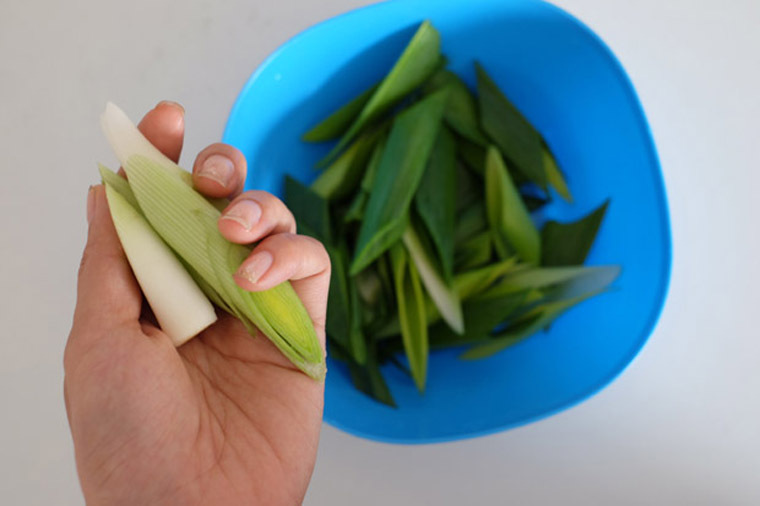 Chop leek into 2 inch horizontal pieces, then separate the white and green portion. Remove hard bits from the black fungus and tear bigger ones into small pieces. Snip off hard tips from lily buds and tie a knot in the middle of each strand. Chop beancurd into 2 inch length. Cut off hard stems from mushrooms and slice thinly. Mince garlic. Step 4 FRY AROMATICS: Heat 3 tbsp of oil in medium fire. 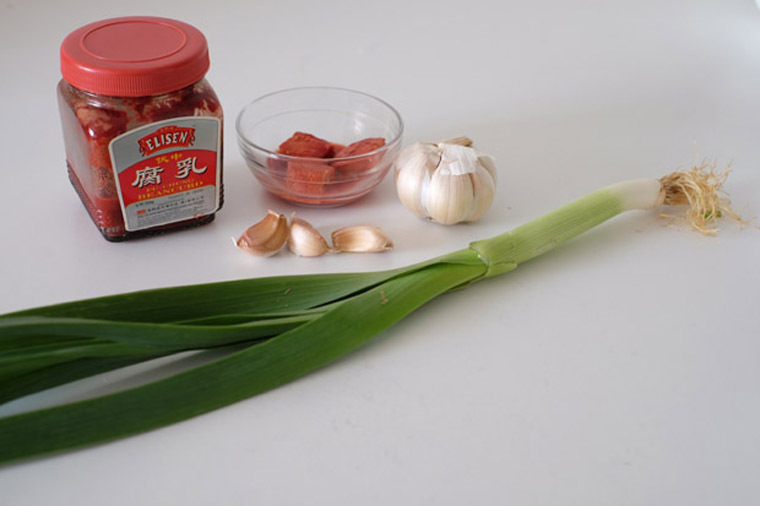 When oil sizzles, add the red fermented bean curd, garlic and the white portions of the leeks (2 min). Step 6 BRAISE VEGETABLES: Add 1 1/2 cup of water and dried beancurd. Gather all vegetables in the middle of the wok to ensure they are soaked in the water. Cover the wok with a lid, and reduce the heat to medium. Cook until vegetables are soften and stir occasionally (5 min). Remove the lid, pour in glass noodles and seasonings. Turn on heat to its highest. Stir until most of the liquid has evaporated (3 min). Step 7 SERVE: Dish out on a large and beautiful plate. Fry 3 cubes fermented bean curd + 2 cloves minced garlic + white leeks in 3 tbsp of oil (2 min). Add and fry mushroom + wood ear fungus + lily flower (2 min). Add and fry carrot + cabbage + green leek + tofu (4 min). Pour 1.5 cup water and dried beancurd, cover and braise for 5 min. Add glass noodles + seasonings (2 tsp sugar + 1 tsp sesame oil + 2 tbsp soy sauce). Turn on heat to its highest and stir until most of the liquid has evaporated (3 min). AUTHENTIC BUDDHA’S DELIGHT: Keeping it strictly vegetarian. A disciple of the Buddha should not eat the five pungent herbs — garlic, chives, leeks, onions, and asafoetida. This is so even if they are added as flavoring to other main dishes. Hence, if he deliberately does so, he commits a secondary offense. You can omit garlic, leek and even fermented beancurd if you like. In that case, instead of frying garlic and fermented bean curd, start with frying shiitake mushroom to compensate the flavour. Mushrooms, like garlic, contain glutamate (a compound in MSG) which gives a good umami taste. However, the addition of garlic and especially red fermented beancurd adds another dimension to the dish. Do include them if you’re not particular about making traditional Buddha’s Delight; it’s so much more delicious! Do you normally have the strict Buddhist version of this dish?